Do you put seismic design and detailing in the too hard basket, and 'design around' the problem? The amendment No.2 for AS3600, 1994 - Concrete structures was issued in mid-1998. In the amendment many of the provisions for seismic detailing currently contained in Appendix A were transferred to the main body of the Code. At present Appendix A provisions are informative only. The amendment will include many of these provisions in the sections of the main body of the Code relevant to their application. This move is designed to alert engineers to the need to consider designing for seismic performance in the same manner as any other kind of applied load. This will impact particularly on column design and detailing. There are two primary reasons why these changes are necessary. Firstly, experience from such earthquakes as the Northridge earthquake, in California, and the Kobe earthquake, in Japan showed that column detailing, even in moderate earthquakes is critical to the survival of the structure. This has been confirmed by local research into the behaviour of structures in Australian conditions. This is especially true of columns in structures of limited ductility. As most concrete structures designed in Australia are of limited ductility, detailing has taken on new importance. Secondly, it has become apparent that many engineers are not comfortable with the Code provisions introduced in 1994. For one reason or another they have not been applying the details appropriately. As a result, many structures theoretically designed and detailed in accordance with the Code are likely to be under-reinforced for ductility in even the moderate earthquakes that we experience in Australia. The Australian Standards Concrete Structures Code sub-committee BD/2/3: Earthquake Design & Detailing meets to discuss the latest advances in practice, both in Australia and overseas, and its potential to require changes to the structure of the Code. The committee decided that incorporation of basic ‘deemed to comply’ provisions included in the body of the Code would be the most effective way of ensuring that engineers provided a minimum level of ductility in their structures. Inadequate details in columns is the most common casue of failure. A paper presented at the Concrete ‘97 conference held in Adelaide last May outlined the proposed changes. The paper, titled Improvements to Seismic Detailing Requirements for Reinforced Concrete Structures in Australia since 1994 highlighted the process of change, concentrating on those provisions slated for inclusion in the main body of the Code. The news for designers is not all bad. The results of studies indicate that although some detailing practices need to be tightened, some provisions, imported to AS3600-1994 from the then current US Code, are too conservative for Australian conditions, and can therefore be relaxed. Columns - The main source of change in the new provisions stems from recent research, which indicated that column ligature spacing is probably too great in many cases, and the enhanced detailing required for Intermediate Moment Resisting Frames (IMFR’s) and irregular structures, should be applied more uniformly. The rationale for this is that it is not only in areas expected to form plastic hinges that significant levels of column ductility are required. Regardless of the structural system the designer chooses to employ, it is imperative that the column is detailed such that it has sufficient ductility to way to the same extent as the primary lateral load resisting system. This is a principle known as ‘drift compatibility '. Failure to address this principle by designers has led to some spectacular failures, even in modern construction, most notably in the 1989 Loma Prieta and 1994 Northridge earthquakes in California. This effect occurs due to the fact that even in a moderate earthquake of reasonably short duration, the shear capacity of a column can be exceeded by the demands placed on the column, which has been designed to resist primarily vertical loads and only limited moment. Hospitals and other important structures require extra care. The result is that even if a full collapse mechanism does not form in the lateral load resisting system, these non-seismic resisting elements can fail and the building, although still standing, would be unusable after an event that would not be expected to cause more than cosmetic damage. Beams - It is proposed that all beams, including prestressed and band beams, shall be required to have a minimum amount of reinforcement carried through at support positions. This is to cater for the possibility of moment reversals that can occur during an earthquake. Details and reinforcement levels are indicated for both flexural and shear considerations. Due to the wide usage of band beam systems in Australia, specific requirements are provided to help ensure that problems with punching shear and curvature ductility demands at supports are minimised. Walls - Walls are the most common form of lateral load resisting system used in Australia, so as well as being used to transfer vertical loads to the footings, they must also be capable of transferring the horizontal loads. Historically shear wall systems have performed very well in earthquakes. However, minimum provisions for perimeter reinforcement and the connection reinforcement to the footing system have now been included. So, what’s happening to Appendix A? With all the changes to the requirements in the main body of the Code, it may appear at first glance that there is not much left to be covered in the Appendix. The revised Appendix will cover structures in Earthquake categories C, D and E, and Intermediate and Special Moment Resisting Frames and Dual structures. The Code sub-committee believes that the proposed amendments reflect the state-of-the-art in seismic detailing for building structures in areas of moderate seismicity. They contain influence from both overseas best practice and the results of local experience and research. 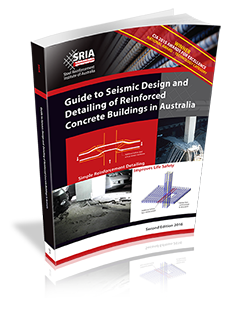 It is felt that these amendments provide for more consistent, effective and economic practice of seismic design and detailing practice in Australia. A publication based on this paper is available from this web-site or you can obtain your copy by contacting SRIA National Office.